HOME MEMBERS PHOTOS NEWS JOIN US! 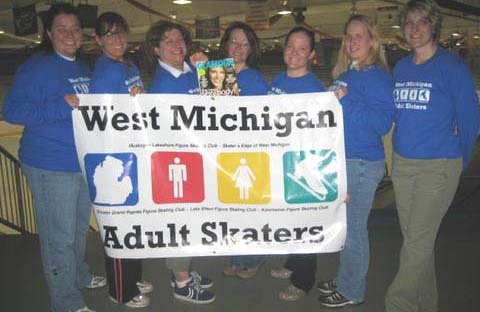 We are a group of adult competitive and non-competitive skaters located in West Michigan. We formed based on the strong friendship between our members, and exist to support each other during practice and competitions. Our members have traveled to many different competitions each year. We are not a registered club with the USFSA, rather, we are made up of individual members of the USFSA through Greater Grand Rapids Figure Skating Club, Skater’s Edge of West Michigan, and Lake Effect Figure Skating Club. Our skaters train at local rinks including Georgetown Ice Arena, Walker Ice Arena, Patterson Ice Arena, Kentwood Ice Arena, and The Edge Ice Arena. We range in skill level from beginner to Adult Gold. Please contact us if you are interested in skating with us or learning more about becoming an adult figure skater. © 2008 West Michigan Adult Skaters - All rights reserved.